There are a lot of initiatives a real estate property can take to connect to their audience; they might post daily, real-time content on social media, or send out weekly e-blasts, or partner with a blogger to expand their reach. All of these are good strategies that should absolutely be executed, but nothing really brings a property face to face with their audience like an event. Any event that a commercial or residential real estate property hosts is a direct extension of that property’s brand, and it should reflect the personality of the community that brand is trying to embrace. Show your audience a good party, and they’ll show you increased interest and conversions. 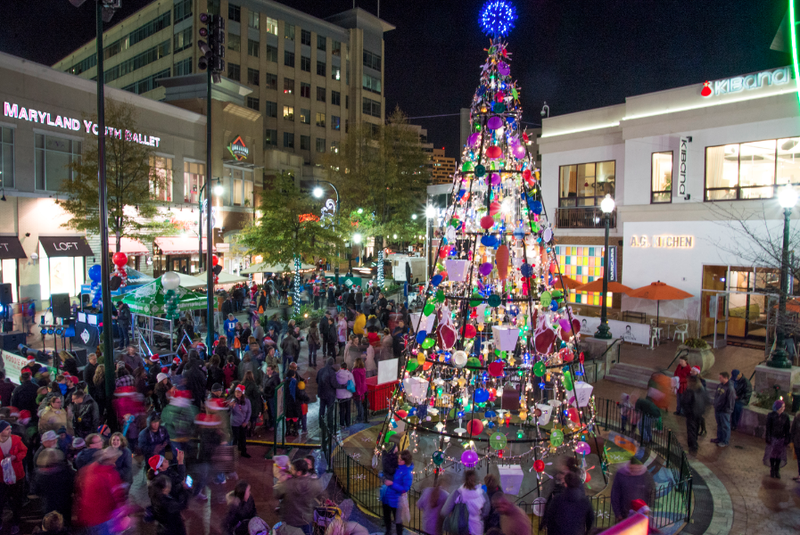 Take our client Downtown Silver Spring’s annual tree lighting for instance – while the phrase ‘tree lighting’ might immediately conjure up images of firs and madrigal choirs, in keeping with its identity as a modern hotspot, Downtown Silver Spring takes a much less traditional route. In lieu of a spruce, the eclectic shopping and dining atmosphere erects a 30-foot art installation, and chooses beat-boxers and “Watch Me Nae Nae” over a chorus. This particular commercial property embraced the community of their target audience, and has adopted their personality as an extension of their brands and events. If you’re a local foodie, definitely check out Foodie Festivus, Downtown Silver Spring’s calendar of culinary-inspired events this season! Events for residential properties can be used to physically show prospective tenants how their property complements a person’s lifestyle. The menu, entertainment, and décor should be chosen with the overall branding of the apartment or condo in mind. When our client Fort Totten Square hosted its most recent open house, they chose a backyard BBQ theme, with beer tastings from local brewery Hellbender, a concept totally in-line with Fort Totten’s image as a hip, local hangout. This concept was specifically chosen to highlight the amenities, neighborhood, and relaxed atmosphere of the building. Had they served foie gras and champagne, the open house would not have resonated as much with their audience. Whether a property’s brand is traditional and glamorous or contemporary and eclectic, it’s important that it remains true to its brand and audience and represents them both during their events.